stampwithamber - Amber Meulenbelt, independant Stampin' Up! demonstrator: Introducing This and That ... and win a trip to San Diego! Introducing This and That ... and win a trip to San Diego! Come meet Stampin' Up! 's newest product line that lets you capture it all on-the-go! 'This and That' will be in the 2013-2014 annual catalogue, but as a sneak peek, it is available beginning today! And until April 30, you can get a deal on the bundle for 15% off! The best thing about this product is that it is completely customized to how you want to use it - with the washi tape, you can attach your movie tickets or other memorabilia right then and there! 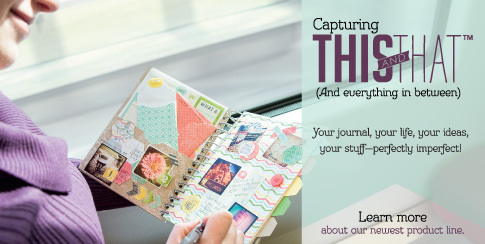 For the launch of this new product line, Stampin' Up! is having a contest on Facebook to win a free trip for two to San Diego! While enjoying your trip, you can use This and That to keep track of trip moments as they happen! Enter now! Here are the components in this bundle (they are all available separately, but why would you do that when they're discounted as a bundle!!). Check out the video for how you can use This and That ... and pay attention! Do you have eagle eyes?? Did you notice that 2 of the 2011-2013 In Colours (Calypso Coral and Pool Party) are included in this bundle? Watch for the upcoming retiring list to see what that's all about!